Did you ever wish to train Krav Maga straight from the source? ​To learn from the best possible wealth of knowledge? Israeli Krav Maga Master Eyal Yanilov (President and Head Instructor of KMG) will be in Tokyo Sunday April 16th 2017 to conduct an unique seminar. Krav Maga is known to be the most effective self-defense system, and Eyal Yanilov is probably the most respected Krav Maga Master in the world today. For about 20 years Eyal was the closest assistant to Krav Maga's founder. He educated all the first generations of instructors outside Israel and was the first to bring Krav Maga to over 40 countries, including Japan. 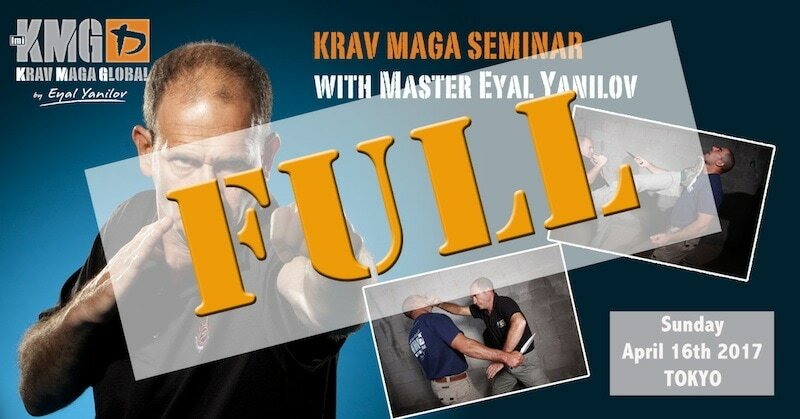 This seminar is your best option to discover the authentic Krav Maga directly from the source! The seminar is open to everyone from complete beginners to advanced practitioners, for KMG members and non-members. If you are interest in discovering Krav Maga or if you want to improve your Krav Maga or self-defense skill don't hesitate to contact us now! Place of the seminar: Noa Studio Gakugei Daigaku, see detailed address and map below. Eyal Yanilov (born in 1959) studied Krav-Maga under the personal tutelage of its founder, Imi Sde-Or (Lichtenfeld), and has served as the Grand master's closest assistant and foremost disciple since the early 1980s. Imi regarded Eyal as family and as the natural heir to lead the system. He initiated him during 24 years of training. For this purpose Imi had awarded Eyal with the founder's certificate of excellence and for the first time awarded the rank of “Expert 8” – the highest level he ever awarded to a Krav Maga practitioner. Eyal Yanilov is the autor of the reference manual "How to defend yourself against armed assault" written together with Imi Lichtenfeld the Founder of Krav Maga. In 1996, with the Imi's support and blessing, Eyal founded the International Krav-Maga Federation (IKMF). The goal was to spread the system and the knowledge outside of Israel. But the structure of the IKMF did not permit nor allow such developments or professional progress. So, after over two decades of traveling all over the globe, Eyal decided to create a new organization. An organization that will keep the true spirit and knowledge of Krav Maga and Imi, and within it all will be able to develop, spread and monitor the knowledge and the advancement of students and instructors. The KMG - Krav Maga Global, was created early 2010. ​Now as before, Eyal, together with his most advanced students who serve as local directors or chief instructors in their countries, are the key force in spreading Krav-Maga teaching throughout the world. Mr. Yanilov is currently serving as president and chief instructor of KMG – Krav Maga Global, and heads the International School of Krav Maga. In this capacity, he is in charge of the development, definition, and dissemination of the system. Master Eyal Yanilov has enhanced and developed Krav Maga to become the preferred combat fighting system for the military, police, and special forces around the world. Noa Studio Gakugei Daigaku, Himonya 25-05-10, Meguro-ku, Tokyo.